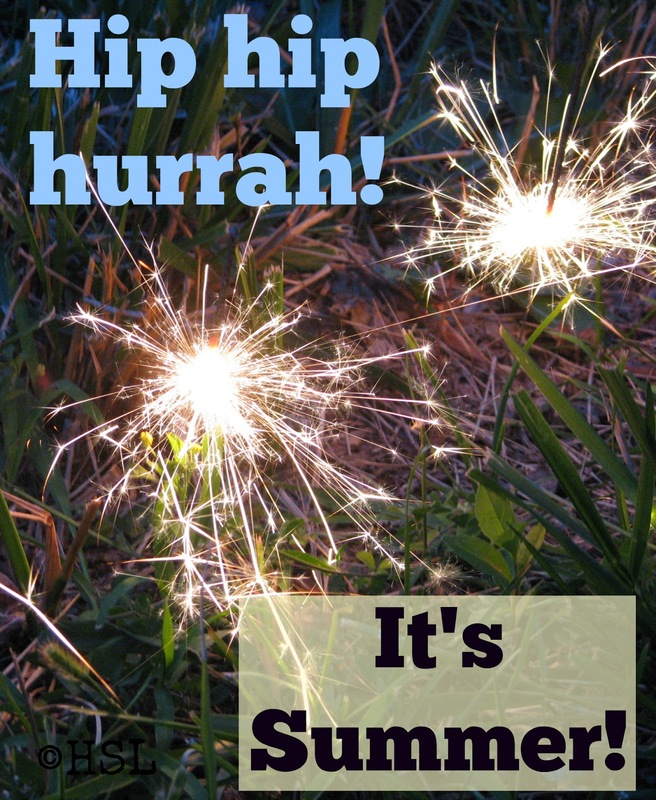 Working and Homeschooling ~ Week 8 ~ Why We Take Summers Off! Last week I mentioned in the Hip, Hip Hurrah! 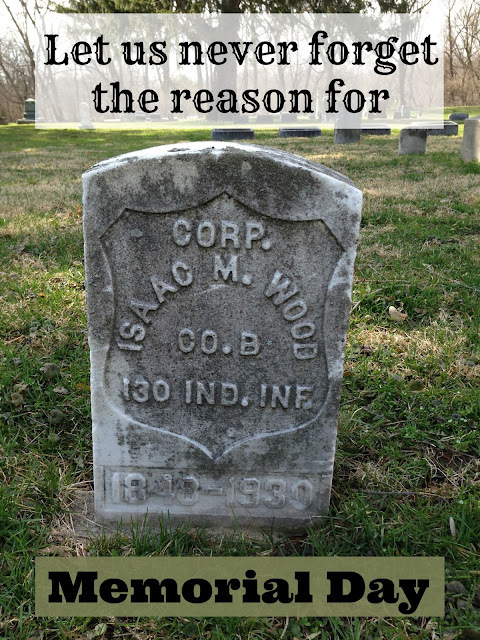 post that I would share some of the reasons why we take summers off of formal homeschooling. Today I'll try to explain why we have chosen the 'long summer break' calendar for our homeschool, and some of the activities we enjoy in the summer. The weather is pleasantly warm for most of our summer months, and all of us would rather be outdoors than indoors 95% of the time. The rest of the time it's either thunder storming (which we enjoy watching from the covered front porch,) or its above 90 with a 95% humidity and we'll escape to the air conditioned house. We do run our air conditioning, usually around 75 degrees, but we also use fans a lot, both ceiling fans and box fans. One of the first things we did after moving to this house many, many years ago was to install three ceiling fans. I need the break from the responsibility of making sure math and science assignments are getting completed every week, AND, we like to garden. Well, at least Arlene and I like to garden, and Emily can usually be persuaded to join us. This is a summer break from formal book learning, not a stick your head in the sand break. God has taught me many lessons from working in the garden. 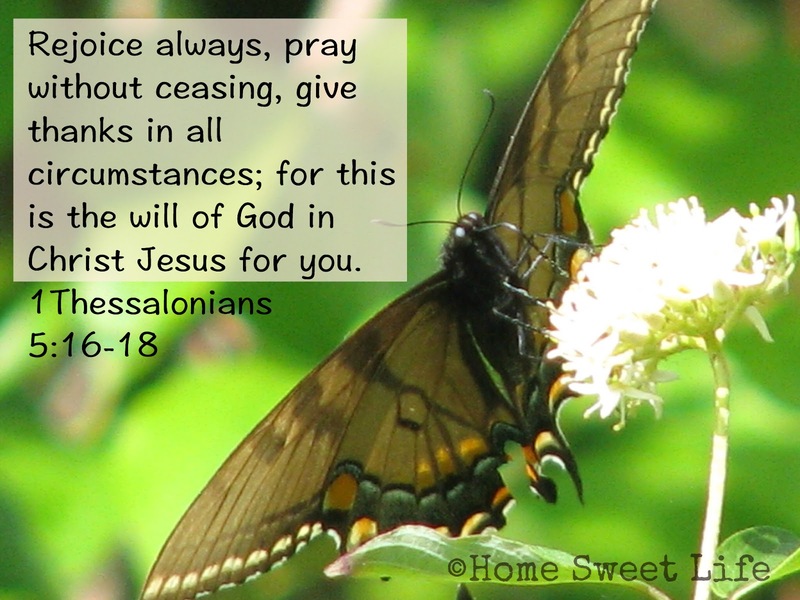 Tending my plants has given me greater insight into many of Christ's teachings . . . about the vine and the branches, the lilies of the field, scattering seed and good soil to name a few. The girls need a chance to just be children. You may think that now that they're in their teenage years that it would be all work and no play, far from it ~ it's a lot of work plus a lot of play! They still enjoy riding their bikes, going to the pool, playing in the sprinklers, visiting the zoo w/Grandma, hiking through the woods, sitting on the porch eating ice cream, and spending time with their friends. This is a homeschooling journey, not a sprint. God gives us times of refreshing for each person in the family. Sometimes those breaks happen all at once, and sometimes one person has a busier schedule than the others, and those being refreshed are able to serve the family in a new way. When you go on a journey, you make stops along the way: refuel the car, get snacks, drop coins in the toll booth, visit roadside attractions, and stop to sleep for the night. Home education is like that too. When you are working and homeschooling, you probably value those breaks more than some others do because you realize how short they are in relation to the length of the journey. The girls like to do summer time activities like 4-H and volunteer work. Kurt and I do some volunteer work as well, and by stepping back form the bookwork, we can all focus on our hobbies and ways to serve others. The girls spend some time during the school year thinking about and planning their 4-H projects, but most years, the real work begins after the last official day of school in mid-May. Our State Fair runs most of the month of August, and we all enjoy attending several times during the fair. Often, the girls have had projects advance to the State Fair, and they want to go see them on display. Our state requires 180 days of attendance per school year. We have traditionally started the Tuesday after Labor Day and are easily finished around May 10th each year. There have been a couple years when I tried adjusting our schedule, and it didn't work as well for our family, so we went back to what works best for us. Isn't that the point of home education? Being able to tailor it to fit each child's individual needs? Sometimes it's about meeting the parents' needs too. Summer vacation can be magical. The sun is up early and stays up late. We get up early and try to fit as many memories into each day as we can. Some days will just be ordinary ~ and yet ~ for a child who struggled through a particular subject that past year ~ any day without school is extraordinary! A long summer vacation is filled with endless possibilities. We ask the girls for suggestions as to what they want to do, and try to fit some of those into our schedule. When both parents are working it takes planning and patience to accomplish the scheduling necessary to both be off on the same days to do family activities, but it is worth it! We go outside. I would much rather sweat than freeze, but for the most part, our summers are moderate, and trees abound to give us shade in the hottest part of the day. The girls and I are involved with 4-H. They work on and exhibit projects, I am a club leader. It is work, but FUN work, and the rewards of seeing the various children in our club grow and learn new skills is priceless. We find water. Kurt loves to canoe, or we go wading, or sit on the dock, or find a pool. There is something freeing about being able to get as dirty or as wet as you want, and then wash it all off in the shower and go to bed bone-tired at night. We grow strawberries, green beans, tomatoes, lettuce, and peppers. We go to the local Farmer's Market for other vegetables and fruits. Melons don't do well in our gardens, and cucumbers require too much maintenance. It's easier to buy them at the market and eat whatever's in season. We also grow a lot of flowers, mostly edible ones! We hike, we walk, and we bike. There are several biking trails near our home, as well as a state full of parks to explore. We fill up our backpacks and head outdoors. We visit friends. Near or far, we try to make it a point to spend more time fellowshipping with our friends. Cookouts, watching ball games, seeing a parade ~ they're all options! Field Trips ~ we still do these in the summer, especially to nature themed areas. More hours of sunlight in the day equals more time to make family memories. We like star-gazing. In the summer you have to stay up later to see them, but it is also warm enough to do so comfortably. We like to watch the Perseids meteor shower in August, but to really enjoy it, you need to start watching at midnight. Painting, tree trimming, house repairs... they all happen more easily in the summer during our vacation than trying to fit them in during the school year. Yes, that's right, we take more than three months off every summer. Are there years when the girls need to work on math or science once or twice a week during the vacations? Occasionally. Like the summer that Emily had just mastered long division in April. I made her do a lesson each week that summer, because neither of us wanted the heartache or frustration of starting over again on long division. KWIM?! We still learn during the summers, but not formally. We most definitely keep reading our Bibles and talking about the LORD. We focus on making memories and tying heart strings. We allow God to re-create us. Summer vacation offers times of refreshing. It offers more chances to make messy crafts (outside) like stepping stones or woodworking. Summer vacation can mean parades, fairs, picnics, and long drives through the countryside in response to the question "Daddy, where does that road go?" 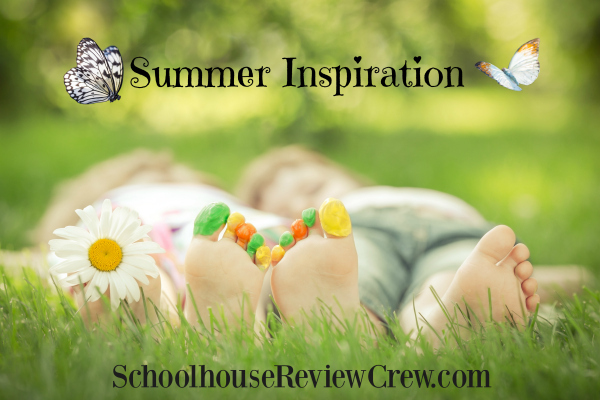 If you are working and homeschooling ~ take the summer off! You'll be glad you did, it just might be magical! Need more ideas on what to do during your summer vacation? Click the picture below! 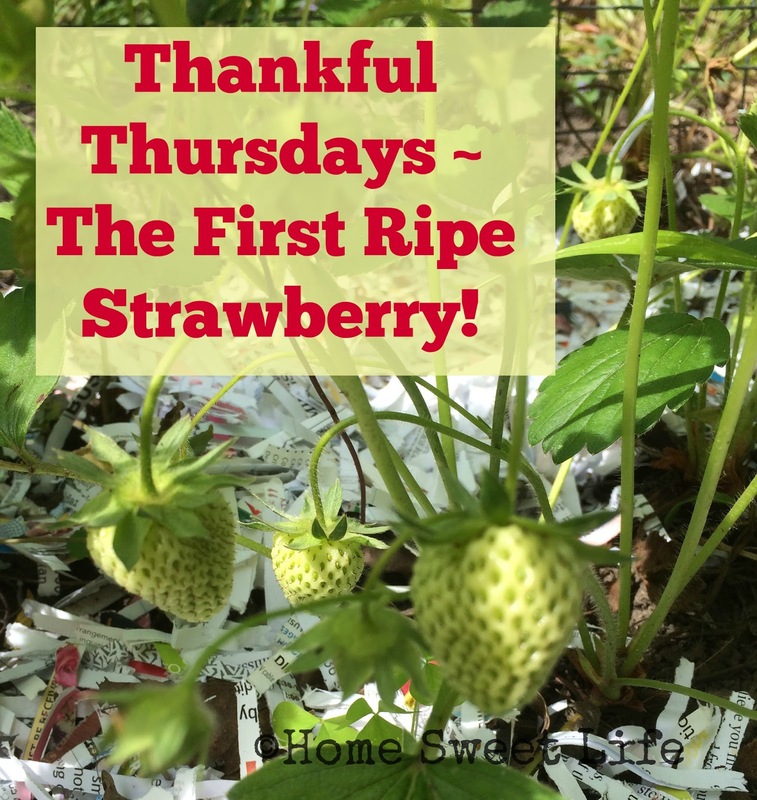 Thankful Thursdays ~ 5/26/16 ~ The First Ripe Strawberry! I'm thankful for the lessons God has taught me over the years while tending our strawberry patch. Sometimes growth is slow, sometimes growth is fast. Sometimes it happens when you least except it... like when the June-bearing plants fruit again in September. We started with just four plants, now we have dozens. God has taught me that sometimes life escapes the borders you put in place. Sometimes the healthiest thing you can do to gain control is to give a part of your life, or extra plants, away to your friends. A patch of strawberries is full of possibilities. Just like your daily life, some things will mature to perfection, and some will become overripe before you notice them and need to be put in the compost pile. Sometimes when it looks ready from one angle, you turn it over and realize there is still maturing that needs to happen. As we seek God's direction, we learn to put down the good choices for the best choices! The first ripe strawberry was wonderfully sweet and flavorful. Why is there only one that ripens days ahead of the rest? I may never know, but God does. That is another valuable lesson to learn about life: God has the answers, and He will reveal the ones we need, and keep the ones we don't need hidden. That is why we can trust Him, because His ways are higher than ours, and His ways are perfect! Here is to many more ripe strawberries, and many more lessons to be learned in the garden! 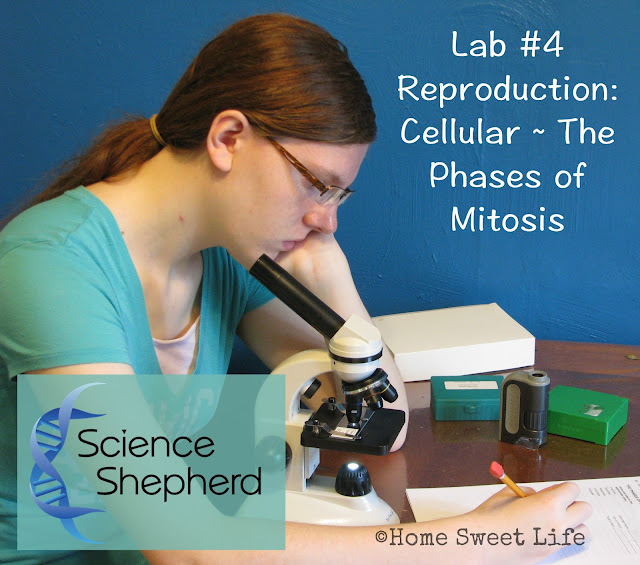 Arlene has been using the Biology curriculum from Science Shepherd for the past several weeks and we are both highly impressed. 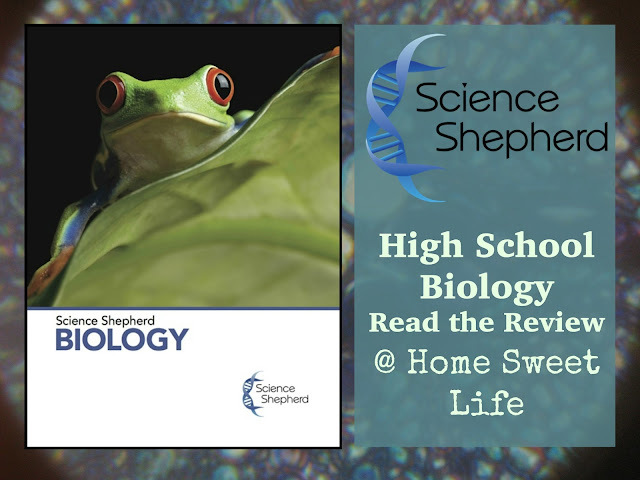 This High School level Biology set has several key components that work synergistically to provide an excellent education for the student, as well as ease of use for the parent/ teacher. 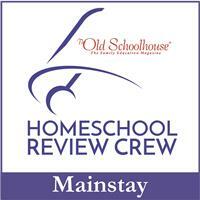 We feel fortunate to have been selected for this review from the Schoolhouse Review Crew as it both fills a need, and fits Arlene’s learning style. We received five pieces for this review, so grab your iced tea because we’ll cover each one, then share our overall opinions. The five pieces we received from Science Shepherd included: Biology Textbook - 2nd Edition, Answer Key & Parent Companion, Test Booklet, Lab Manual, and Lab DVD. This is the 2nd edition of the textbook, and the main changes from the first edition are in the chapters on Origins: specifically the Creation/ Evolution sections. This book is unashamedly written from a Creationist standpoint, but it does not shove it at you on every page. I appreciated the introduction where the author, Scott Hardin, MD, talks about his revisions, and the conviction he felt from the Holy Spirit to re-write chapters 17-19 for the 2nd edition. The origins debate is presented from both sides, and in this presentation Dr Hardin presents how the actual evidence we find while studying Biology points to a Creator, and not to molecules-to-man evolution. The other chapters focus on the topics presented, and do not try to sway your student’s thinking about origins, but simply teach them good observational science skills. This is a balance lacking in some other curriculum we have looked into. The textbook is divided into 34 chapters and has over 700 pages of text. Fear not! This textbook was written by a MD, who happens to be a homeschooling Dad, so it reads more like a living book than a textbook. Each chapter is focused on a topic or two, and each topic is divided into key points. It includes a lot of pictures, tables, and diagrams, which are labelled by figure numbers so the student can easily find which one the text is referring to for each reference. Arlene likes that each key point has its own smallish section, so it is easy to stay focused on one point at a time, yet still see how they relate to the Chapter’s topic. This also makes it easier to start and stop the reading in manageable chunks of time for whatever level reader your High Schooler currently is. Each chapter begins with a preview section highlighting key points that will be covered. Each chapter ends with a review of key chapter points, definitions for that specific chapter, and study questions. I appreciate the definitions being in each chapter, instead of at the end of the book. This is definitely an in-depth Biology course! It covers all of what I learned in Biology 1, plus a lot of what we covered in my AP Biology 2 course. I know that was a long time ago, but I feel certain that Arlene is getting a solid, thorough biology education with this book! Chapters 1-16 are a general introduction to Biology, biochemistry, cells and cellular reproduction. Chapters 17-19 focus on the Creation and Evolution origins ideas and how we see them being confirmed or denied in Biology. Chapters 20-29 move the student through biological classifications beginning with viruses, and moving through bacteria, protist, fungi, plants, and up to the animal kingdoms. Chapters 30-33 are focused on human anatomy and physiology, while Chapter 34 is focused on Ecology. This is MY favorite part of this curriculum. It has four key parts that make my job as the parent/ teacher so much easier. FYI- your student can work through this curriculum by themselves, and with this Companion you will still know exactly where they are and what they’re learning, without investing a huge amount of time! The first part of the book is the Schedule. It outlines how your student can complete the textbook, 20 labs, and 15 tests over 36/ 5 day weeks. Yes, it is an intense curriculum, but worth the effort! Most weeks include a catch-up/ study day scheduled right in. If you are concerned with your student being able to cover it all, consider using this 3 or 4 days a week for 3 semesters, and adjust their schedule accordingly. This course is designed for 10th-12th graders. If your student is not used to working independently, I would not recommend it for a 9th grader. Let them mature a year, and get used to a High School workload first. The second part of the book includes the answers to the study questions for each chapter. This is golden for parents who may be working with other students, or be pressed for time. If your student is getting stuck on a particular study question, you can look it up and discuss it with them to gauge their understanding. Then you will know if they need to do more review of that chapter before moving on to the next chapter. The third part of this book includes the biology test answers. Understand that for 34 chapters, there are only 15 tests. This section includes helpful guidelines about administering the tests. It also suggests how giving the test orally can help your student focus on communicating their knowledge, and not on the composition of writing out the answers. Since the questions are mostly short-essay style, this will be our method of choice for testing Arlene. We both appreciated the comment about how being able to answer more than half of the questions correctly shows a good base of knowledge for those sections. This in-depth course is focused on learning, not just on being a good test-taker! The fourth part of the Answer Key & Parent Companion is the Companion part. It gives you a summary of each chapter’s main focus points, and the key concepts you’ll need to know to stay up with your student. For most chapters, this is 4-5 pages (without all the diagrams and photos,) as opposed to the student text which can run 10-39 pages a chapter. See why I love this book?! These 15 tests each cover 2-3 chapters, and are designed to be an in-depth analysis of whether or not your student has mastered the material. The tests are mostly short-essay style questions, with a few true/ false questions. There are no multiple guess questions here! The note to parents in the front of the book suggests only assigning every other or every third question if you are having them write out their answers. In here it also suggests the oral test option. “The method of test taking should not be a stumbling block in your student’s performance.” You can tell this was written by a homeschooling Dad, and not a textbook committee! The lab manual is spiral bound so it will lay flat while your student is using it. While it includes pages for recording each lab, it also has a general lab record sheet on page 6 that states “copy this page.” Your student may want to do more than is required for the microscope labs, and this is a wonderful way to record it all. The first lab focuses on the scientific method, good record keeping, and using your microscope. You will need a microscope, but it does not have to be a fancy $300 one for your student to benefit from these labs. Pages 2 & 3 in the Lab Manual list each lab and its needed materials. This is good because it lets you easily look ahead and make sure you have what your student will need. Because Arlene’s older sister Emily took Biology a few years ago, we already own the prepared slides needed, Microscope and supplies, plus the dissection kit & pan. We will just need to purchase a few preserved critters for the later labs: clam, earthworm, grasshopper, fish . . . and maybe a fetal pig if I can stomach the thought! If you were thinking you would save a few dollars and skip purchasing the Lab DVD - don’t! You’re going to want this powerpoint style DVD to help you & your student better understand the labs to complete. When the schedule says to complete a lab, your student is going to read through the Lab Manual, then watch a short presentation on the DVD. This presentation will give them a second explanation of what they will be doing, and what they should be looking for while doing their labs. Yes, I know it is a $50 DVD, but from a parent whose child has often been frustrated to tears while trying to perform some sort of science lab or other and not understanding what she is supposed to be observing, or getting stuck with the how-to steps ~ This DVD is priceless! If you are purchasing the 3 books as a set, plus the Lab Manual, and DVD, you will pay $155. Then you’ll need the lab supplies and microscope. This is comparable to purchasing an online program from many other High School level biology courses, and much less than some of the most well-known book plus DVD ones. 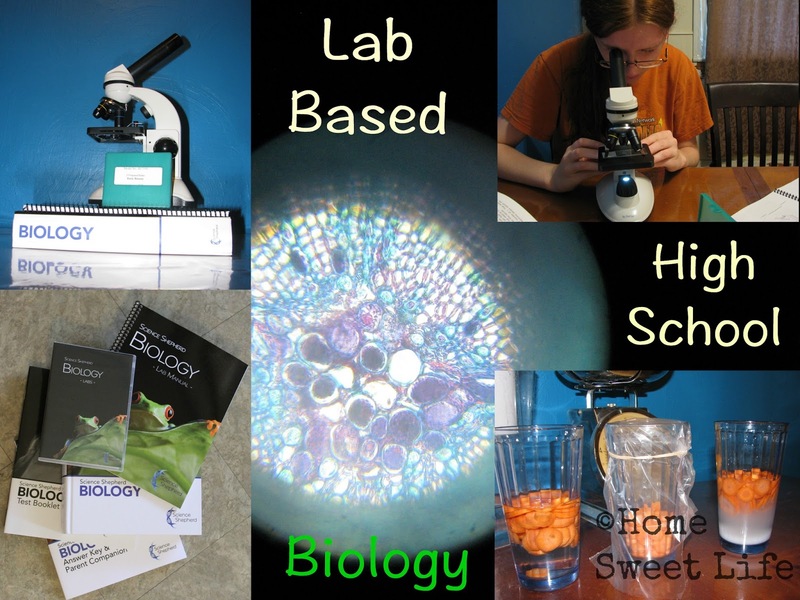 If you’re doing High School Biology as a lab course, you’ve probably already priced out your microscope choices. Choose what fits in your family’s budget. Science Shepherd has a lab kit and dissection specimen kits available through Rainbow Resources for this course. 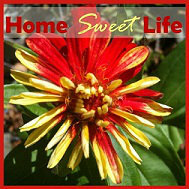 Both Arlene and I were pleasantly impressed with the ease of use, and the depth of knowledge covered by this course. Because Arlene is planning a career focused on Botany, I knew we would want her to have a Biology course that was in-depth, but also worked with her learning style. We have always followed a Charlotte Mason style approach for science. While your first impression of a 700+ page textbook may be daunting, please know that this reads like a living book, only deeper. For those families that have preferred a traditional textbook approach, this will also fit your bill because the scope and sequence is both broad and deep. Yes moms, you can check those little lesson boxes off as they complete them if you want to. I like the balance of text reading, thinking, formulating their knowledge into responses for the test, and the number of labs. This course fits our needs, plus our desire to have a cohesive study of Biology from a Christian viewpoint. Arlene liked this curriculum because even though it explained complicated science, it did it in an easy manner of small bites so she didn’t become confused or overwhelmed. Overall, Science Shepherd Biology gets two thumbs up! It is a solid, thorough, understandable Biology course for High School. The Crew also reviewed Science Shepherd’s Introductory Science for Elementary grades, and Life Science for Middle School. Click the banner below to read all the reviews! Hip hip hurrah! It's Summer! Summer vacation has officially begun at our house. What does that mean? Less bookwork and even more time spent outside. Longer days, star-watching at night, and lots of watermelon! Many families school year-round. We're taking the summer off. Stay tuned for more on WHY we take summers off starting next week! Life is full of challenging days. Days when the internet doesn't work, days when the children are sick, or disobedient. Days when the workload can seem overwhelming and you just want five minutes to sit down and put your feet up. We all have challenging days. We should be going to God and asking for mercy and help for the day ahead every single morning. We should be praying all day long, asking for guidance, asking for His light to shine through us to others. Let today be the day that you go to God, asking for mercy and guidance. No formal prayer needed, simply pour out your heart. The Holy Spirit is waiting to intercede for you. Go now, and stay at the feet of Jesus. 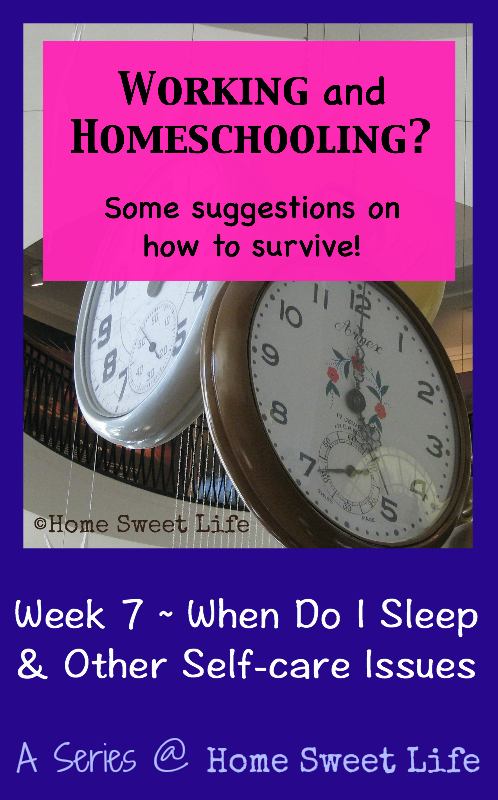 Working and Homeschooling ~ Week 7 ~ When Do I Sleep? After a particularly challenging week of work, I thought it appropriate to take some time and talk about self care for working Mamas. Thus, this week we will be answering the questions of: When Do I Sleep? ... and other self-care issues. *This post contains two affiliate links. These are to my favorite vitamins and sunscreen. If you have questions about them, feel free to ask! I am disclosing this in a accordance with FTC regulations. Hopefully by now you've realized that working homeschooling Mamas must plan ahead. When we don't plan, the semblance of order in the home collapses. It is much easier to keep the ship going forward, even at a slow speed, than to start it up again once it has crashed. This means: YES, you're going to have to schedule in your sleep! Now I know from years of experience that scheduling sleep can be a pain. Who really wants to go to bed on a Sunday afternoon at 4 p.m. when the rest of the family is playing outside? No one. However, sometimes that is precisely what you need. If you have a hard time winding down to fall sleep (especially if you are working nights and sleeping days, or need to take an evening nap,) choose to read a devotional or your Bible before going to sleep. Don't worry about falling asleep while reading your Bible...you'll do your Bible study during the day with your children, or with your spouse, or even while you eat breakfast. This is making a conscious choice to read something reflective before sleep. Do NOT read a novel before bed...or you'll never get any sleep! Kurt used to call me his sleep camel. For several years he was working days, I was working nights, sleeping mornings, and educating the girls after they had lunch (my breakfast.) Every Friday night I would crash and crash hard. It was not uncommon for me to sleep 12 hours straight through until Saturday morning. It kept me going, because there were multiple day during the week when I was averaging 5.5 or 6 hours of sleep a day. Was this an ideal situation, being a sleep camel? No! Of course not! Was it my reality? Yes! That leads to some other self-care issues. Why do working and homeschooling moms often wear jeans or long skirts when everyone else seems to be wearing shorts? Because those strapped for time would rather sleep another 10 minutes than take time to shave their legs every other day. LOL! 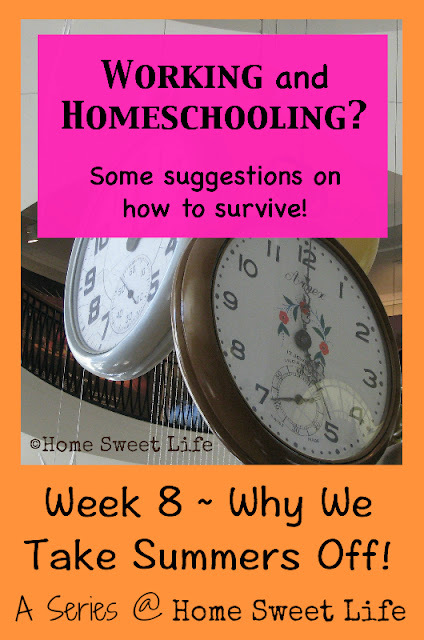 Working Homeschooling Mamas need to have a self-care routine. It needs to be quick, easy, and effective. If you deny your self-care needs, you'll end up sick, and then everyone suffers. Do you take multivitamin everyday? Do you wear sunscreen on your face everyday? Do you have regularly scheduled alone time w/ your spouse every week? I have a basic routine that I've followed for years. Yes, it varies, but usually not by much. Good routines make easy habits to accomplish in a short amount of time. Here is my basic routine: Get out of bed, drink my vitamins, hop in the shower, get dressed, apply sunscreen & comb my hair. Eat breakfast (granola, or hot oats in the winter,) and finish my vitamins. I usually read my email on my phone while eating my bowl of cereal. Next, If I'm working days: I finish packing my lunch, kiss the girls, and head out the door. If I'm working nights (& this routine just happened while the girls are eating lunch,) then it's off to do math or grammar or science with the girls ~ whatever they need help with the most. Other self-care questions? There are a lot of them, so let's talk about a few. When do you file your nails? Almost never. I cut them with clippers. I work with my hands everyday, and I've been blessed by God with some sturdy, fast-growing nails. I plan to clip them once a week (yes, they grow that fast,) and I do it after applying sunscreen and before eating breakfast. When do you go to the Dentist, Eye Doctor, Doctor? Not often. I try my best to stay healthy, so visits are limited to actual need. Our local dental clinic has a sliding-fee scale for payment, so I try to schedule my appointments there a few weeks in advance so I can make sure to have it at a time I can be off of work. Usually the first appointment after lunch is ideal. Even if they're running late from lunch, you're still one of the first they see, so wait times are minimal. Eye Doctor? About once every 15-18 months, as needed. They have evening appointments too, so it varies based upon what I'm currently working. One appointment to NEVER miss? The Chiropractor! We have an awesome chiropractor who keeps me healthy by fixing what I mess up. Every three weeks. What? Yes, every three weeks! I am positive that her tremendous care is what has kept me this fit for all of these years of hard manual labor! If you live nearby, just ask, I'll refer you! When do you grade papers? Is this really self-care? Yes! Because I cannot let things stack up for me to get around to "sometime" because that sometime never comes. I rarely grade papers. I give most of the girls' non-math quizzes orally, leaving only a few things that actually need graded each month. Now that they're both in High School, we have found several self-grading or self-evaluation courses for them to use, making my job as teacher much easier. When do you do things for fun? Often, rarely, daily. This one depends on your definition of "fun." I try to see each challenge as an opportunity for God to work through me. My paying job can sometimes be fun. Watching one of the girls understand something for the first time can be fun. Weeding the garden can be quite satisfying...especially when there are fresh strawberries to pick! Daily. It might only be five minutes in my Bible, but I make it a point to read every day. Sometime I take a small book to work to read on my lunch break. Sometimes I'll put an e-book on my Kindle app on my phone. If we're going on a family trip, I usually take the latest issue of Molly Green or our National Parks magazine to read in the car. Magazines are easier, because I can either browse the pictures, read on article, or just amuse myself depending on what else is going on in the car, and how far Kurt will be driving before I need to do something. When do you get Christian Fellowship? Mostly on Sundays at church. We have a wonderful church body, and we usually all stay after services and fellowship while we have lunch (each family brings their own, and we share desserts.) That gives us a couple hours to talk, share, and have fun together as a church body most weeks. We also talk, email, and text each other during the week. 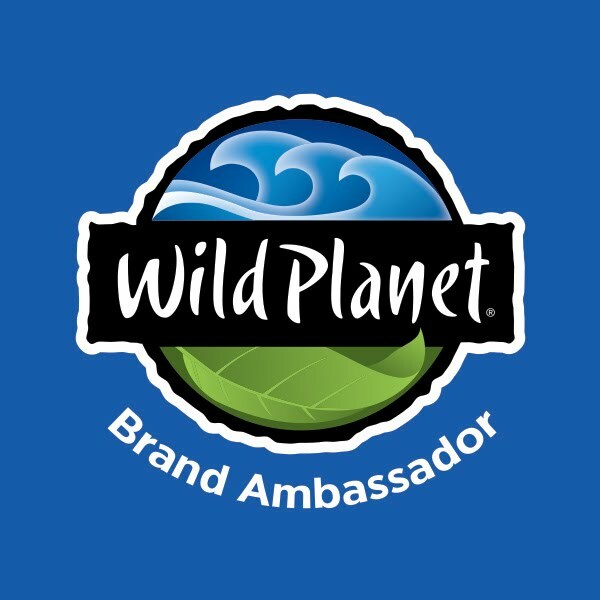 I am also a part of a wonderful group of bloggers who share, encourage, and pray for each other. Sometimes my life looks crazy to outsiders. Some days, it might even feel a little crazy to me. Mostly though, it's just lived to the fullest. Jesus promised that in John 10:10 ~ The thief comes only to steal and destroy; I have come that they may have life, and have it to the full. Earlier this week I went to the poll and voted. I've voted my entire adult life. Whether or not you choose to exercise your right to vote, please keep reading. I would like to share some thoughts that made this Spring's voting unusual for me. I've gone to the same voting location for over a decade now. This week something was different. This time Emily was old enough to vote. How did it happen that our firstborn daughter is grown up enough to join the voting public? One day at a time. When the girl were little, we would talk on our way to and from our voting location about why we vote, and various ways taxes are spent. Early this year, our conversations turned to the candidates, what they were talking about, and why it mattered. We talked about how the things Emily had learned in her Civics class were being played out in front of her eyes. So, this time, Emily and I went together to vote. For the rest of the week, I thought about what this new milestone in both of our lives meant. What you teach your children day by day matters. It matters a great deal! How you view the world matters... are we following the Biblical mandate to pray for our leaders? Do we daily remember that this world is not our eternal home? Our citizenship as Christians is in Heaven. We are to be in this world, but not of this world. God is the one who raises up men and takes them down. No matter how the elections end, the most important thing I have taught to my daughter is that she can trust God to take care of her through it all. 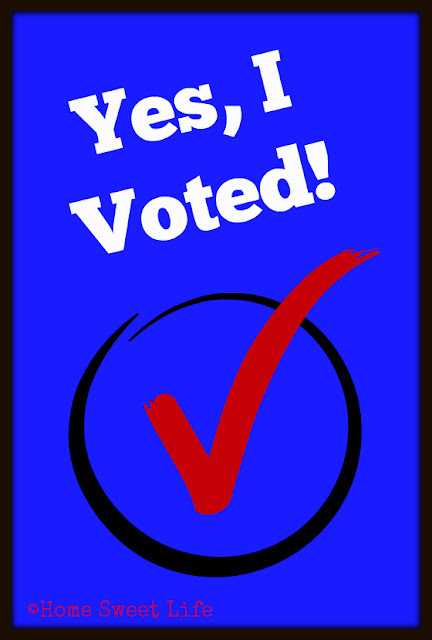 Yes, I voted! But more importantly, I loved my daughter enough that she cares about the world around her. As she steps into adulthood, she knows the One who holds the world in His hands.